A husband-and-wife duo have opened their newest restaurant downtown — just in time for the 2017 Super Bowl. 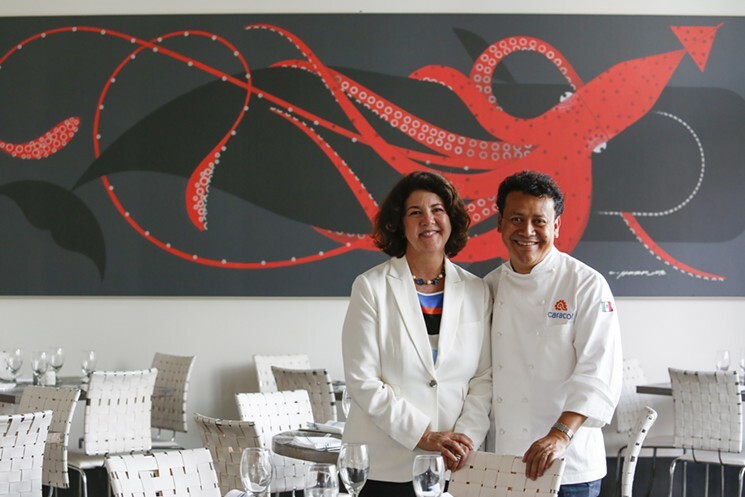 Chef Hugo Ortega and his wife, restaurateur Tracy Vaught, opened Xochi on Jan. 27 on the ground floor of the Marriott Marquis, which is serving as the official headquarters for the National Football League. The hotel, which overlooks Discovery Green at 1777 Walker St., opened in December. Xochi — from Xochitl, the goddess of the flowers — means to bloom or catch fire. The restaurant’s menu incorporate themes from Oaxaca, the culinary capital of Mexico. Authentic Oaxacan herbs will be used in the menu along with several moles, including a mole sampler plate, according to a statement. A variety of meats, seafood and vegetables will be prepared on the horno, or wood-fired oven. Items include barbacoa de res de zaachila (braised skirt steak rolled with hoja santa, guajillo and costeño pepper broth, potato, carrots, masa dumplings), bistec con mole de chicatana (grilled prime Black Angus ribeye, seared black bean tamal, ant mole); and lechon (slow-cooked suckling pig, huaxmole, plantain molotes). Sopa de piedra, an ancient, traditional fish and shrimp soup, heated with hot river rocks from the horno, will also be served. Tlayudas, the iconic street food dish of Oaxaca, is another menu item. Thin Oaxacan tortillas will be offered with various toppings – from beef to pork to mushroom – and cooked over wood in the horno. Tacos, tamales, memelas (toasted masa pancakes with roasted pork rib), tetelas (triangular blue masa envelopes filled with cheese) and other street food classics will be served. Insects, delicacies in Mexico, will be found on the menu in dishes such as the queso del rancho, which is housemade queso de cincho with chicharrones, three insects and guacamole. Desserts at Xochi, crafted by executive pastry chef Ruben Ortega, feature traditional flavors of chocolate, chiles, tamarind and corn, among other flavors.